I used to be an avid fan of the first few seasons of Masterchef Australia. It was then that i was introduced to this lovely dessert – Pannacotta. It looks amazing, tastes heavenly and is very simple to make. Pannacotta is an Italian dessert made using milk, cream and gelatin. It is a good dessert option if you are having guests over for dinner. You can make this a day in advance and refrigerate it till you serve. You can combine panna cotta either with raspberry jelly or strawberry coulis. The panna cotta can be inverted on a plate before serving. Removing the pannacotta from the ramekin is not easy and takes practice. Sparingly oil the inside of the ramekins/teacups with vegetable oil before pouring in the panna cotta mixture. This will ensure that the panna cotta slips out of the dish easily before presentation. At the time of serving, place the ramekins (bottom only) in hot water for 20 seconds. Insert a small knife between the pannacotta and the ramekin. Invert the ramekin onto a serving plate and tap it to release the pannacotta. 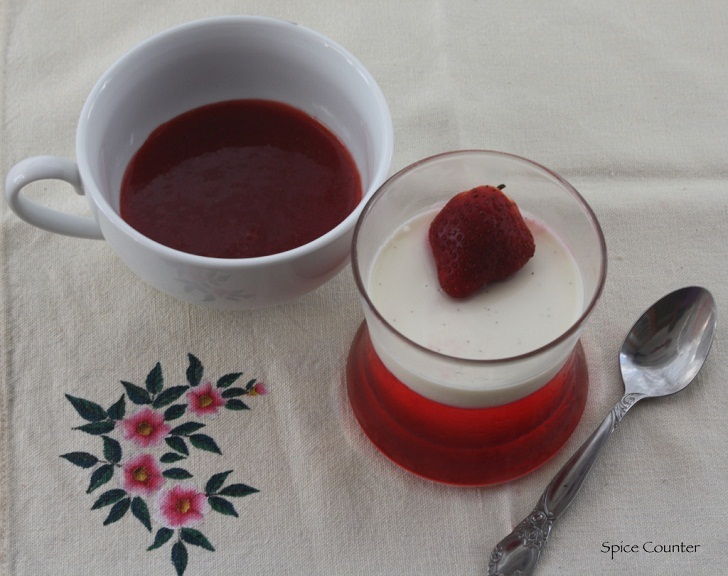 You can serve the panna cotta with the raspberry jelly or with strawberry coulis. Add the milk, cream and sugar to a pan. Halve the vanilla bean lengthwise and scrape out the seeds. Add the seeds and the pod to milk- cream mixture. Place it on the stove and bring this to a simmer and take it off the heat. Remove the vanilla pod from the mixture and discard it. Strain the mixture if you have used vanilla beans and want to remove the traces of the vanilla seed. Heat 2 tbspns of water. Add gelatin to this and stir it till it dissolves. Add this to the milk- cream mixture. Once the jelly mixture has set pour pannacotta mixture over it and refrigerate for 4-5 hours.